Keto Low Carb Chili Recipe - Quick and Easy! 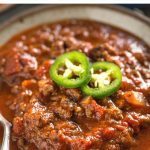 Low Carb Chili is a ridiculously easy weeknight dinner to make, it’s all the usual chili flavors you love cooked together to make a great chili recipe without beans. Now some chili aficionados are adamant that beans have no place in chili anyway, which surely means we are on the right track! I used ground beef for my Keto Chili and it worked perfectly. I do love ground beef recipes as you can throw them together quickly which is perfect if you’re mostly a last minute person like me! 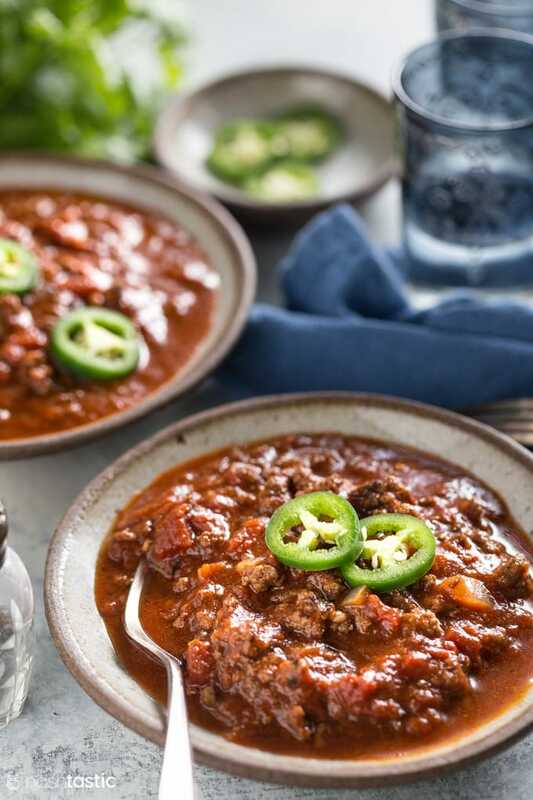 This recipe for Low Carb Chili has about 8g net carbs per serving, with around six servings total. Most of the carbs are from the amount of fire roasted tomatoes, but they really add flavor to this recipe so I think it’s worth it. Next, saute the onions in a little oil until soft, do not brown, then remove from the skillet. Brown the ground beef in a olive oil, make sure you break it into small chunks. Now add the garlic, Ancho chili powder, cumin, oregano, cayenne pepper, and return the onions to the pan with the meat. Then let it simmer for 30-40 minutes. The low carb chili tastes better if you leave it overnight for flavors to develop. the best way to brown ground beef for chili! One of the frustrations in cooking ground beef is that it can generate quite a lot of liquid as it browns. What sometimes happens is that you essentially ‘steam’ the meat instead of browning it. One way round that of course is to try to do it in little batches, but that doesn’t always work. And then of course if you pour off the liquid/fat afterwards you are pouring a lot of the accompanying flavor down the drain, we don’t want that! 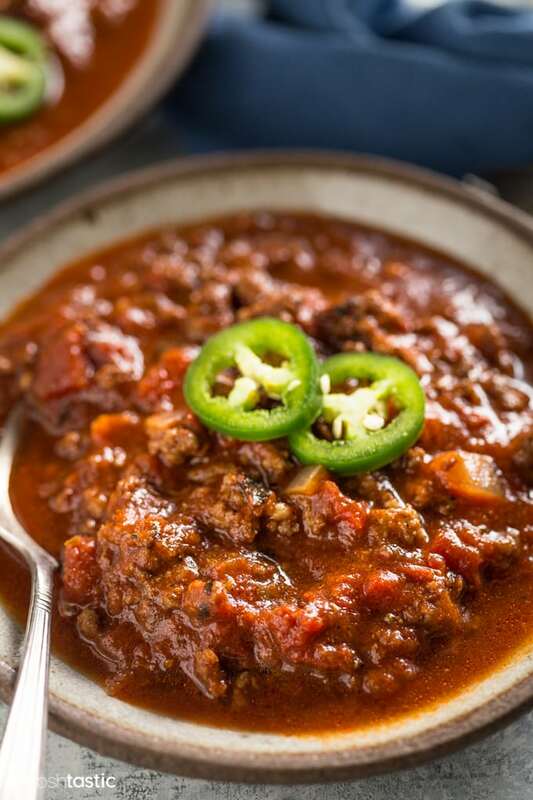 Well, I came across this excellent tip in Cooks Illustrated recently and knew that it might be the key to transforming my low carb chili recipe! The idea is simple, but genius. You simply add a little mixture of baking soda (NOT baking powder) to the ground meat, mix it well and leave it to sit for at least 20 minutes, I have all the details in my recipe below. The baking soda helps the meat to retain the moisture as it browns, and I promise it REALLY works!! It’s made a huge difference to the finished keto chili recipe so I would urge you to try it. Usually my ‘browned’ meat is sitting in a large puddle of water and fat, but not this time, it really was browned! We served it with cauliflower rice, but I think a nice green salad goes well with it too and is a great low carb option if you’re trying to stay away from crackers. And our fall back low carb side is always green beans. Although they are not in the least bit traditional in terms of serving with chili I think they work well together and I know all the people in my house will eat them without fussing! 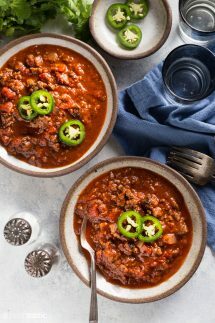 Quick and Easy Keto low carb Chili with no beans! Add the chopped onions to a large pan or Dutch Oven and saute in a little oil for about 3-5 minutes until translucent, then remove the onions and set aside. Add a little more oil if needed to the same pan and brown the beef, taking care to break up the meat into small pieces as you cook it. Add the garlic, Ancho chili powder, cumin, oregano, cayenne pepper, and return the onions to the pan with the meat. Add the beef broth and fire roasted tomatoes to the pan and stir well. This Keto chili is now ready to eat, but it will taste better if you let the flavors develop overnight in the fridge. my chili turned out delicious i’m so happy i tried it and its so satisfying. Hi Brooke, This makes about 6 servings for one pot of chili if you make the recipe as written. I don’t know the actual serving size, you’d need to put it in a measuring cup I’d guess to find that out. I have the macros and net carbs per serving (assuming 6 servings per the whole recipe) already listed in the recipe if that helps, so if you have half in the freezer then it would be three servings. I hope that helps! Made this tonight for dinner. Was the perfect amount of kick with the spice combination to combat our snowstorm. Will make this again! Can you adapt this recipe to make it in a slow cooker? you sure could! 🙂 I haven’t cooked this specific recipe in a slow cooker, however here’s what I would do if I was going to try it. I would follow all the steps as written up to step three where you brown the beef. Then add all mixture that to the slow cooker and add in the garlic, herbs and spices, and I would reduce the liquid, so perhaps only 1/2 cup of beef broth. I would cook it on low for about 5-6hrs. My family loved this recipe. I’m from Texas this was Great chili!! I added a small can of chopped Green chilies st the end and stirred. Sprinkled a little cheese green onion and put 4 crumbled pork rinds around edge to give it that crispy texture like a taco. Will definitely make again Thanks so much! !